Taoists reason that negative emotions can be transformed to utilize their life-force energy. Therefore, to expel or suppress unwanted negative emotions is to expel or suppress life-force. Rather than suppress negative emotions in the Taoist system, you benefit more by experiencing them. This means you permit them to emerge, but do not let them run wild or trigger other negative emotions. Instead, put yourself in control of them so that you may transform them not only into useful life-force energy, but also into the higher consciousness that is your spiritual energy. When connecting the senses with the organs in chapter 3, you may have noticed your emotions beginning to emerge. You can control them. Review table 1 on the next page to note the negative emotions you will want to transform. Some people have repressed their emotions and react strongly to this practice as their emotions surface. If you are one of these people, spend more time practicing the Healing Sounds and the Inner Smile. Work with healing the organs before attempting to transform the deeply buried emotions within them. As you transform the negative emotions of each organ into useful energy, use the Counteracting or Controlling Cycle to help balance the energy. Smile down, and generate the qualities of loving energy in each organ. As in the previous chapters, create the front pakua. 1. Turn your consciousness toward the ears, and listen to the kidneys. Become aware of fear or any sensation that you do not like as it manifests in the form of a sound, taste, color, shape, or feeling. The energy may be chilling and cold, cloudy blue, or contracting. 2. Spiral and breathe the fear and any other emotion you do not like out of the kidneys, and collect it at the kidneys’ collection point. 1. Move the tongue, connect the tongue with the heart, and become conscious of impatience, hastiness, cruelty, or any sensation that you do not like deep within the heart. It may manifest as a feeling, shape, sound, or image. The feeling can be of energy rushing out, and you can see and feel something wrapping and pressing in a bad way into the heart. The negative feelings of the heart can be sensed as a very muddy, red color, or can be hot, unsteady, small, noisy, or acidic. 2. Spiral and breathe these emotions out of the heart and collect them at the heart’s collection point. 1. Spiral and breathe the negative energies out from the heart’s and kidneys’ collection points to the front pakua. Spiral and blend them at the front pakua. The pure energy trapped in these negative feelings will be freed and released to the center of the pakua. 2. Spiral the heart’s and kidneys’ energies until they become a bright, golden energy. This energy radiates love and gentleness from the center of the pakua and your being. 1. Return to all the organs and their collection points, and spiral and breathe to draw out any remaining negative energy. Blend and neutralize it with the energy in the front pakua. 2. If you feel you do not have enough energy to transfer the negative emotions, you can call upon another source of energy within you to help. Become aware of the love and joy in your heart. Bring these emotions into the pakua and they can help transform the negative energy. Turning the senses inwardly initiates the training process of inner observation. In developing the ability to focus inward--to smell, listen, taste, see, and hear the organs and their activities--and to observe your negative emotions without predetermined judgments, you have the opportunity to develop your true nature. In the same way that turning garbage into compost makes it useful, transformed negative energy also becomes useful. You are increasing your life-force rather than throwing it away. By making room for positive energy to grow, your life-force will continue to increase. 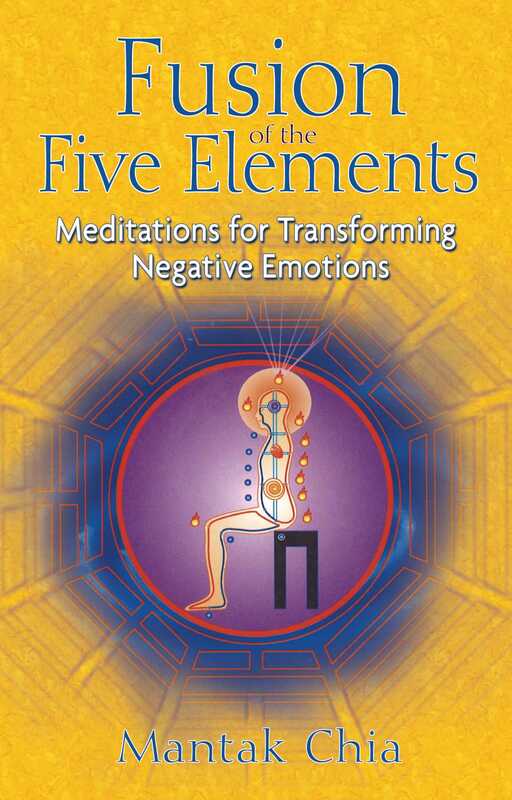 "The delightful surprise in Fusion of the Five Elements is the way the range of feelings from each of the major organs (liver, heart, lungs, kidneys, spleen) is described, along with marvelous tables and illustrations that accompany the energy work meditations."